I love rowing a drift boat. Time on the oars puts me in a meditative state and I become one with the current. Let’s face it, when you’re fishing you concentrate on where you are casting. In a day of throwing streamers or dries, a full day can pass and you rarely lifted your eyes from the small area along the bank that you’ve been casting to for 8-hours. In the rowers seat, I see the entire river. I see fish rise in the distance, wildlife on the banks and birds in the air. 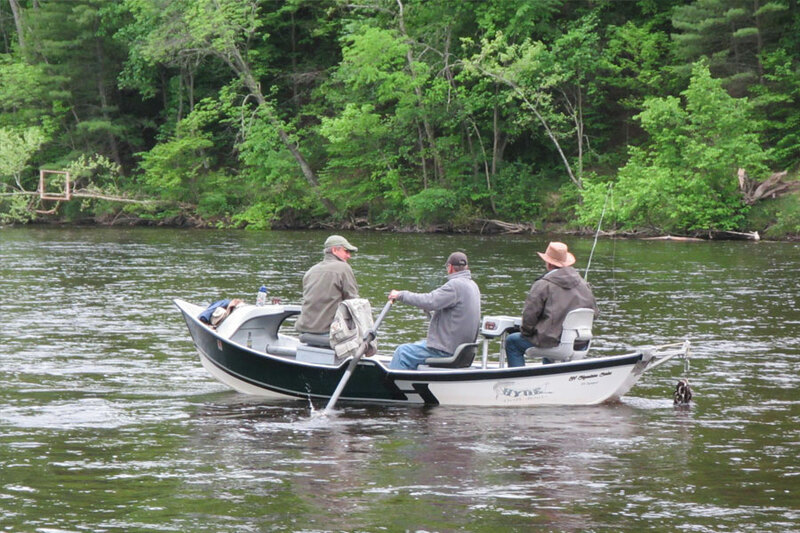 Mostly, I get to watch people fish – and I appreciate that observation is a powerful learning tool. All the lovely things aside, rowing and properly positioning a drift boat through countless river miles is work. Anglers can either make that job easier and pleasant or, frankly, pure hell. That said, I offer the following suggestions to make days on the river pleasant for both angler and rower. Stay centered in the boat. Dipping an edge of a drift boat is like catching the edge of a snowboard and the equivalent of a hydrological face plant. There is nothing more painful or unpleasant than trying to row a drift boat that is kattywompas. Sit square in the seat when you’re in it and stay centered when standing and casting. Stow your gear. A drift boat is no place for an episode of hoarders. Line can catch on loose items and people can trip over things and go for a swim. Nothing good can come from having junk all over a boat. By all means, pack light. Use the cup holders. Most boats have two near every seat. If you fill one with leader and pliers and the other with a pipe, lighter, or cell phone, the drink you left sitting on the deck is going to spill. Cleaning sticky soda and beer out of the boat is a pain. Respect casting zones. If you have the pleasure of riding in the front seat, there is an entire river below you to fish. Leave the water on the sides of the boat to angler sitting behind you. Don’t line over their water and don’t cast into it – they are already fishing at a disadvantage to you. I have witnessed more tension and anger over this topic than any other in the boat. Don’t cast over the rowers head. I have fished with great casters. No matter how good you are, wind, trees you didn’t see and other factors will eventually bury a hook into the rower if you get in the habit of casting over their head. No matter how sincere and heartfelt the apology, it’s painful. Be mindful of your fellow caster and tangles. Tangled lines are inevitable when two people are fishing in the boat. These can be minimized by the upstream angler making sure the downstream angler is fishing before they cast. The downstream angler should fish out a cast after it hits the water and announce “casting” just before they pick up a back cast. Be realistic about snags. Most rowers will go the extra mile to save a snagged fly – just be prepared to break it off. Rowing against the current, deep into deadfalls and tangles is a recipe for disaster. Nobody likes to lose a $5 articulated fly, but it beats thousands of dollars in gear, cameras and boat ending up on the bottom of a river. If the rower does decide to retrieve a fly in a very difficult spot – absolutely keep the boat level and for God’s sake, NEVER, EVER grab branches or sticks and pull or try to pilot the boat that way. Don’t help at the launch or takeout unless asked. Most boating accidents happen at the launch. There are countless videos on YouTube that will provide ample entertainment and proof. Stay out of the way, let the boat owner do their thing — if they need help they will ask. Be prepared to load your items quickly and safely when they say. Also, keep in mind trailers don’t end up down river on their own. Guides and friends pay a spotter – by all means tip or offer to cover the cost. Don’t pee over the side of the boat. The easiest way to go for an unexpected swim is trying to wiz over the side of the boat. No matter how careful you are, you’re gonna drip on the gunnel. Rowers, carry a small bucket and angler’s please use it and rinse it. Ladies, please just give advanced notice so suitable, legal, shoreline relief can be found. Be happy. For all the days we spend not fishing, one would think happiness would be easiest to find on the river when chasing trout or steelhead. Save your frustrations and anger for all those days you’re not fishing. ← A Deadlier Dangle – It’s not over ‘til the fat lady swings.